Universal Materiality is a collective group of work reflecting the research collaboration between the Institute of Textiles & Clothing (ITC), The Hong Kong Polytechnic University, HKSAR (HKPolyU) and the School of Fashion at Parsons School of Design. In collaboration with Open Style Lab (OSL), a nonprofit dedicated to making style accessible for people with disabilities, this exhibition features seven accessible designs with smart material explorations that involved the collaborative work between multi-disciplinary practitioners (inclusive of fashion designers, engineers, and occupational /physical therapists) and long-term residents from The Riverside Premier Rehabilitation and Healing Center. This exhibition encourages you to consider the ways disability is interpreted in bodies, abilities, and through the act of dressing. Clothing plays an important role in promoting and protecting the rights of older people with disabilities and facilitating their full participation in society. The current availability of clothing meeting their needs is not reflective of the positive relationship between style orientation and personal wellbeing. This body of work seeks to strengthen the relationship between the design process and end users, while applying materials that contribute to style preference and functional requirements in clothing. 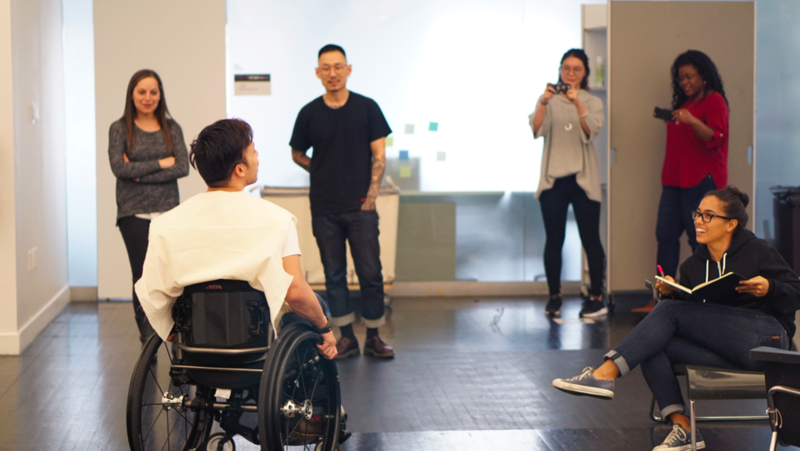 The work reveals two parts of the co-design process: (1) Material studies between both research groups in Hong Kong to examine the potential for smart textiles and digital processes like 3D printing to address specific needs of users; (2) Applying the findings into practice with people with disabilities or older people throughout the 2018 Open Style Lab summer program at Parsons School of Design. The garments, textiles, and material studies inside this gallery integrated considerate uses of technology and style for the residents at Riverside Rehab to live a more independent and expressive lifestyle. Grace Jun, Christina Mallon, Pinar Guvenc, Aroom Han, Kilian Son, Johnathan Hayden, Julia Liao, Vanessa Sanchez, Wooksang Kwon, Kieran Kern, Peter Troljic, Irene Park, Amy Jung, Claudia Poh.